Accused of reckless driving in Washington state? 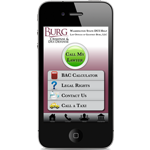 Call us - we can help you. Charged with Reckless Driving in Washington state? We can help. RecklessTicket.com was designed to answer all questions about issues surrounding reckless driving and racing charges in Washington state. We created an entire website on this because the laws are complicated and the issues intricate. How a Washington State reckless driving arrest and the process works. About reckless driving and racing laws. Reckless driving case procedure in Washington. How to help your reckless driving case - things you can do. Reckless driving and racing charges in Washington State require a professional and experienced attorney to protect your rights and to help you achieve the best possible outcome for your case. Reckless driving experience - in the courtroom. We have handled handled dozens of reckless driving and racing cases in Washington state. Together we have over 30 years of experience. We appear in courts all over Washington state defending people accused of reckless driving and racing cases - most often in King, Snohomish, and Pierce counties. We have the experience to handle your reckless driving or racing case, whether or not you want us to negotiate with the prosecutor, or defend you at a judge or jury trial. We have done both, and while it may be new to you, it will not be new to us. If you call or email us, we can set up a time to meet with you to discuss your reckless driving or racing charge.